South Dakota’s Wildlife Action Plan takes a broad view of landscapes from a fish and wildlife perspective and delves into South Dakota’s essential habitats and how they have changed over time. Explore South Dakota with an easy-to-use interactive map. Select from a variety of topics that cover what makes South Dakota unique from a wildlife and habitat perspective. 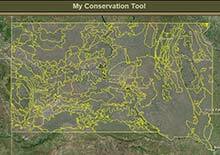 The "My Conservation Tool" allows the user to select an area to determine the plant communities that could potentially exist within those boundaries.